Liancarlo Spring 2016 Bridal Collection is timeless and elegant. Designer Carlos Ramirez creates his dresses with the bride in mind. His inspiration came from flower markets, which we can see in the lace and the softly patterned overlays. 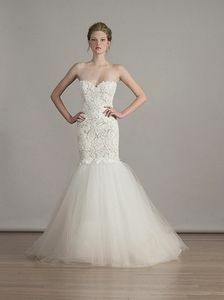 We guarantee that the hand-beaded overlays and Chantilly lace appliqués will catch your eyes. For all you ladies looking for colored gown he has that too. A soft blush gown complete with rose-embroidered tulle. All finished off with copper thread. Scroll through and possibly find the dress of your dreams.